The Sheriffhall Roundabout is known locally as the busiest roundabout in Scotland, assisting in the smooth flow of traffic into Edinburgh through the A720 and out again through the A7. In 2008 the twenty year old hot-rolled asphalt surfacing was coming to the end of its useful life and the decision was taken to increase the roads capacity by widening the approach carriageways and the roundabout itself by adding an extra lane. 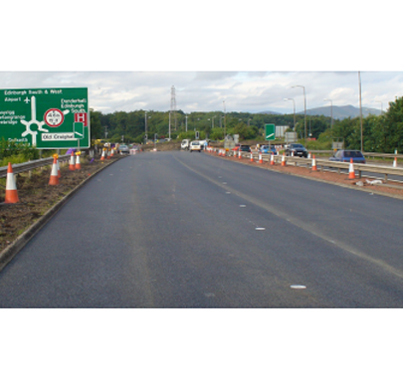 Bardon Superflex Carriageway was selected as the chosen asphalt surfacing replacement after a presentation of long-standing research and development work to Transport Scotland by Aggregate Industries. Bardon Superflex Carriageway was installed as a direct cut and fill application of 50mm, after a 50mm planing of the old hot-rolled asphalt. Other development work on the site included a redesign of the traffic monitoring systems, and the installation of drainage systems underneath the traffic island and new approach lanes.